In this module, you've learned about some of the changes you may need to make as you move into the world of academic writing. For example, you will probably have more freedom to choose when, where, and how you study. You'll also be expected to make your own decisions about preparing for, and completing your assignments. This means you'll need to become aware of the values, practices and expectations that make up the university academic writing culture. You'll also find differences between high school and university writing. Reading, researching and writing requirements specific to your subjects may be different from what you are used to. So, you may need to develop new skills, such as appropriate referencing and time management. The good news is that there is a wealth of resources available to help. However, it will be your responsibility to find out about them. For instance, you'll need know about your lecturer's and tutor's office hours, online resources, and library workshops and resources available in your faculty. Now, how do you feel about getting started with your studies? A useful first step is to check how well you understand what's expected of you. We encourage you to complete the self-assessment exercise on the following page before you move on to learning about critical thinking in Module Two. 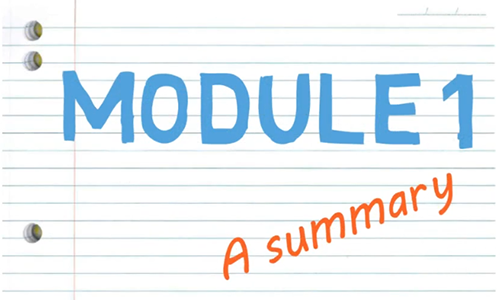 Note: Download the PDF file below so you can review Module 1 later.